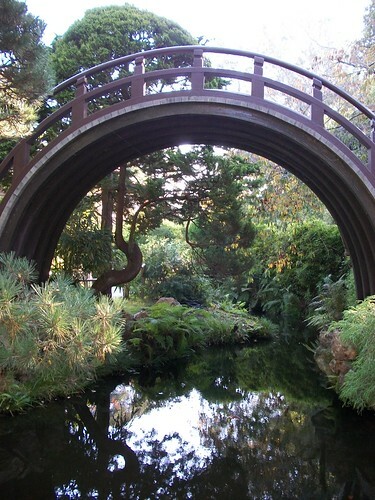 san francisco – somewhat bookish. Dinner at Flour + Water was our first meal in San Francisco and we couldn’t have had a better welcome. We read about the restaurant in the Washington Post about a month before we were heading West and thought it sounded like a place we’d like. Even at the month-out point, we could only get a reservation for 5:45! This is a popular place. Luckily 5:45 was the perfect time for dinner for two tired East Coast travelers whose last meal had been at an airport at 11 AM. The restaurant serves Italian food, focused on pizza and pasta (two things made, onsite, with Flour and Water). We started off with a veggie pizza, not noticing until it arrived that we had selected the vegan option. It was great. I didn’t even miss the cheese (which is saying a lot for me! ), and then split two pasta entrees. On was agnolotti stuff with pork and one was pappardelle with braised pork shoulder. I started out with the agnolotti, and Jami with the papparedelle, but we each decided we liked the others better. Jami described the agnolotti as meatballs in a little pasta envelope, wrapped up like a present. I thought the pasta sauce on the pappardelle tasted like gravy, but in an amazing meat-infused, lucious way – and I don’t even really like gravy. They were transcendent. We ended the evening with a slice of chestnut cake with brown butter ice cream (what? we hadn’t eaten in a long time and we were both starving!). The ice cream was made by Humphry Slocombe, an ice cream shop I had read about in Food & Wine magazine a few months before and it was so, so good. I am only sad that I didn’t track the shop down on my solo day in the city and eat more. The service was good (it was Halloween and the staff was all in costume, which was fun. Our waitress was a pirate) – at a much slower pace than is standard in DC (this was true everywhere we went), which turned out to be a really good thing. It gave us time to really enjoy our food and digest a little between courses. Of all the meals I ate in San Francisco, this one was definitely my favorite. (And really not too expensive – we had all that food, plus a class of wine each for about $100). If you are ever in the Bay Area, I would highly recommend this restaurant. This time last week, I had just arrived back in DC (or really Northern Virginia, out in the wilds around Dulles) from a long weekend in San Francisco. 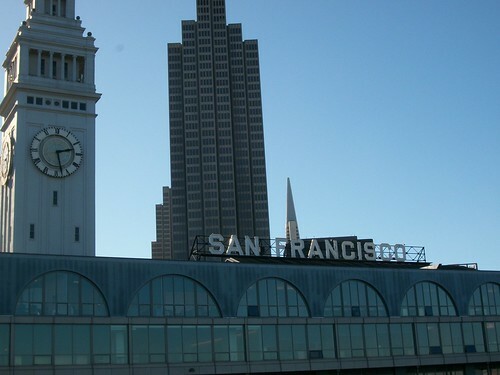 I was born in San Francisco, but hadn’t been back since we moved when I was two. When Jami told me she had a work conference in the Bay Area (Sausalito, to be exact), I jumped at the chance to go back to the city of my birth. It was a great trip – we spent two days in the city (staying at the Westin on Market Street, which I can highly recommend for anyone looking for a nice hotel at a reasonable – for San Francisco – price) and then headed over to Sausalito where Jami’s conference was at a super fancy resort. This is the house my family lived in when I was born (and for my first two years before we moved back east). 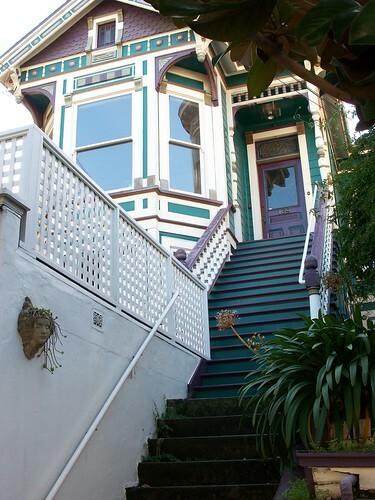 It was a beautiful house, located in the Castro, near a nice park and up a pretty steep hill. And then once you’ve finished pushing that stroller up the hill, my parents still had to tackle those steps. I can’t believe my mom agreed to have a second child (me) knowing that then she would have to get TWO kids up the hill and up those steps, but I’m happy she did. It was neat to have a sense of my first home. We were supposed to see two friends while in San Francisco – one of Jami’s former coworkers from Reno and one of my former coworkers from the firm I used to work at, but neither visit worked out unfortunately. I hope we’ll be able to reconnect with them some other time in the not too distant future. This meant I was on my own on Tuesday, when Jami had to head back to work and I decided to ferry back into San Francisco and try to make it to Japanese Tea Garden. I studied the transit brochure I had picked up on the ferry ride over and to my delight managed to figure (and catch) the MUNI bus that would take me from the Ferry terminal to Golden Gate Park (the 21!). I was so happy I made it. It was beautiful and tranquil and everything I hoped for. Neither of us ever really adjusted to San Francisco time, which actually worked well for adjusting back, but also made for some early mornings. Luckily San Francisco has some great coffee, in addition to their amazing food (and I switched to caffeinated tea for the duration). This was also our first real vacation together – other than a one night stay at a bed and breakfast for my birthday last year, we’ve only ever taken trips to visit our families. Now it’s nice to visit family (in fact we’ll do it twice more before the end of the year), but we found vacationing to be pretty great and are even more excited to have a honeymoon to look forward to next year.